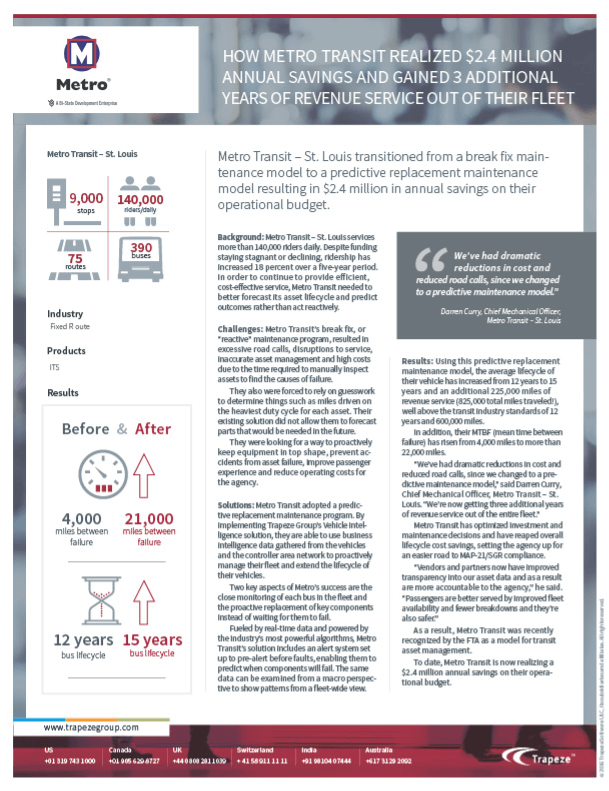 Metro Transit – St. Louis transitioned from a break fix maintenance model to a predictive replacement maintenance model resulting in $2.4 million in annual savings on their operational budget. Challenges: Metro Transit’s break fix, or “reactive” maintenance program, resulted in excessive road calls, disruptions to service, inaccurate asset management and high costs due to the time required to manually inspect assets to find the causes of failure. Solutions: Metro Transit adopted a predictive replacement maintenance program. By implementing Trapeze Group’s Vehicle Intelligence solution, they are able to use business intelligence data gathered from the vehicles and the controller area network to proactively manage their fleet and extend the lifecycle of their vehicles. Find out how they realized $2.4 million in annual savings plus gained an additional 3 years of revenue service out of their existing fleet.